Punctual service – driver was on time, waiting for us with a clear sign. Very friendly, patient and helpful. So it’s the start of the season and morbid curiosity has driven you to take your skis out and flip them over to see just how badly you treated them last year. If, like me, you’ve discovered a horror-show of core shots (holes that go all the way through the bottom layer of the ski) and deep gouges, don’t despair: the good news is that almost all of these battle scars are mendable. And here’s how. A word of warning: things are about to get real. We’re talking metal scrapers, flaming candles of plastic and Stanley blades. So if you’re eyeing up the €800 skis leaning gingerly against your wall with a wary eye and your palms are beginning to sweat, you might want to consider taking them to a professional. You will need to wax your skis after you’re done repairing them, so now is a good time to clean the bases. Depending on the base material of the ski, some people recommend using a base cleaner, while others swear against it. For my part, I simply use a very diluted solution of warm water and washing-up liquid. Using a soft sponge, clean the bottom of the skis and then allow them to dry fully. You will need to clean these up using a very sharp blade. A Stanley knife works well. A good way to help the repair material stay in place is to undercut the holes in your skis – angle the blade so that the cut goes underneath the base material and clean out any messy bits of plastic to leave a clean, neat hole. Then, take your metal scraper in both hands and hold it at an angle: if you’re using a pushing motion, angle the scraper away from you, and vice versa. Gently drag the scraper across the surface of the hole to cut off any bits that may be sticking out. This is when one of your edges has started to come away from the base of the ski. Sometimes, this can also cause some of the base material to curl back, away from the open edge. Start by cutting back any base material that is damaged by undercutting like before and clean up the hole. Ptex (the material we will be using for base repairs) doesn’t bond well to metals, so for anything involving edges you will need to buy a two-part epoxy resin. Mix both parts thoroughly and then use a thin plastic spatula (or whatever you can find) to apply the epoxy under the edge (use a small flathead screwdriver to pry the edge up). If the base of the ski was unaffected by the delam, you can use a couple of small clamps and some scrap bits of plastic to hold it together while the epoxy cures (24hrs). However, if you had to cut away some of the base material, after applying the epoxy underneath the edge you will need to clamp it tight across the width of the ski. Then use the rest of the epoxy to fill the hole and leave it to cure. Try to use as little as possible, so you have less excess to cut back later. Once the epoxy has fully cured, you can remove the clamps and cut it back so that the area you’ve repaired is flush to the rest of the base. A Stanley blade works well for this. Hold the blade flat against the base of the ski and cut away small amounts at a time. Once you’re flush, finish it off with your metal scraper. You can ptex the join between the base material and the epoxy later on, if any gaps have appeared. If these aren’t very deep, don’t add to the damage any further. Use your metal scraper to remove any material that maybe be sticking out. Then take some fine grit sand paper (200 grit is fine) and rough up the inside of the gouges. Do the same to any core shots or delams that you’ve already prepped – this will create a better surface for the repair to bond to. You will need to buy some ptex candles – they come in black or transparent. As the name suggests, ptex candles are designed to be lit. 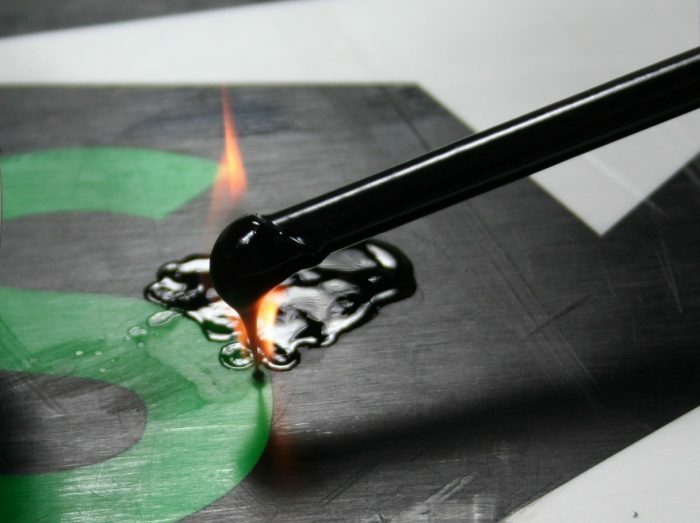 The heat from the candle allows the material to bond to the porous base of the ski. This can get messy, so it’s best to light the candle over something from your recycling bin (a cut Pringles can is awesome). Once it’s lit, the candle will keep burning and a steady trickle of ptex will start to run off of it. To stop the end from drooping too much, keep turning the candle as you go. The aim is to maintain a steady blue flame. To do this, keep the candle low over the ski (about half an inch from the surface). You can also hold a piece of metal (like your scraper) by the flame to stop it burning orange. Follow the lines of the gouges while maintaining a steady trickle to fill the holes along their length. If you’re filling deeper holes (like core shots), pass over them once, let the ptex cool and then pass over them again. Overfilling a deep hole in one hit can cause the ptex to crack. Once the ptex is cool to the touch (5-10 min), you can begin scraping back. Holding your metal scraper at an angle, start scraping from the front to the back of the ski. Vary the direction of each pass, so that you’re removing material evenly. Don’t rush and don’t scrape too hard: patience is the name of the game. Keep going until you can’t see the drop marks anymore and all that’s left of the ptex is the outline of the filled area. (Don’t fear the scraper: get it flat!) If you notice that there is still a bit of a hole, you can ptex again. Et voilà! As the French say. Taking regular care of your skis in this way will stop water absorption like plugging holes in a leaking ship and keep them gliding smoothly for years to come. Follow up your repairs with a good edge and wax, and you’re good to hit the slopes to cause a whole new season’s worth of damage – safe in the knowledge that you can fix it all up again next year.